I was born and raised in the South, and consequently my love for fried foods, sweet tea, and pie started at a very early age. And like so many other people in this world, I paid 0% attention to what went into my body. I just wanted to eat what was delicious. Then I moved to Los Angeles, became an adult, and decided that it was important to figure out what foods made my body happy. And guess what? It wasn’t the fried chicken biscuit I grew up with. But it also wasn’t the bitter kale smoothie craze from LA. It was somewhere in the middle – in between my southern roots and my LA heart. The place that’s health-ier than where I was before, but not so restrictive that I feel like I can’t be a human in the world. I believe health shouldn’t be hard. It should be a series of small choices and changes that make huge differences in our lives. 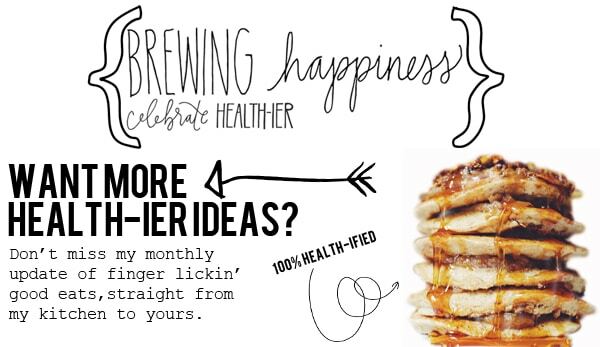 Brewing Happiness is NOT a place for me to judge your current eating habits. Brewing Happiness is NOT a place to feel badly that your produce doesn’t come from an organic local farm, or that you and your family eat the occasional steak or fast food dinner. Brewing Happiness is a place where we celebrate the strength it takes to choose fruit instead of a candy bar. Brewing Happiness does honor the fact that some days are salad days and some days are French fry days. Brewing Happiness is a place for you to ask questions, challenge yourself, and take small steps toward a health-ier life. So you want pizza? Or chicken nuggets? Or the best dang salad of your life? You will find “health-ified” versions of all of these recipes right here, along with as many suggestions on how to make each dish fit your lifestyle. So take a load off, prop your feet up, and welcome to the middle ground. (Yes, you are allowed to live here.) Yes, you are allowed to have it all – salty & sweet, salad & french fries, healthy & happy. New to this healthy thing? Please feel free to ask me any questions via email (haley(at)brewinghappiness.com) or just comment below. Because healthy is a journey that never ends, so we might as well have some fun along the way. Hey Lisa! I’m so sorry that the buttons didn’t work – I’ll look into that. You can always email me at haley(at)brewinghappiness.com with any questions you have. But, no, I did not flip it to cool. That cake won’t expand to the whole pan, so you run the risk of breaking it if you flip it before cool! Thanks! I first heard about intuitive eating from a podcast that Isabel Foxen Duke was on, I’ve been an intuitive eater for about 2 months now. Stumbling on your site is a breath of fresh air. Thank you! G.ad to know there’s lots of us out there! Oh welcome to my site and to the wonderful world of intuitive eating! I’m so so glad you found me. xo. Yas🙌🙌🙌 I found a food blog that really resonates with me! Thank you Haley, this is awesome! That means the world to me! Welcome to the health-ier family, Tenzin! xo. Your attitude towards health and food is so refreshing and I love it! So glad I found your site, its been bookmarked and I cant wait to try all your yummy foods!! Thank you so much for your help towards my better health! Ah Jacqueline! I’m so happy you found me, and like what I do here. That seriously means the world to me. LET’S BE FRANDS! xoxo. I need you to know that the peanut free vegan dog treats have been a saving grace for our sweet boy, Bentley Benjamin. He is allergic to peanuts and we have had a really hard time finding healthy food and treats that are peanut free and are produced in a peanut free facility. Making these at home ensures he’s safe and (BONUS) he loves them! Thank you a million times for sharing this recipe! Our family is grateful! This makes my heart SO HAPPY to hear. If I can bring one sweet dog joy in this world, then I have done my job! xoxo. I’m so glad you like the new site! (I am looking into getting those back – I so appreciate the feedback.)xo. Thank you! That means so much to me – I’m so glad you found my little corner of the internet. xo. Thank You, Thank You. Just found this blog and love it, awesome!!!!! Yes we don’t others to preach to us about eating healthier, we just need someone to help us do it and do it deliciously. Bless you. Oh wow Haley, I just found out about your blog and I LOVE IT!!!!! =) (And what an awesome video. I love what you’re saying, you seem to be auch a positive & wonderful person! :)) Have a great day! Awesome site, Haley! What camera are you using? The pictures (and recipes! :P) look awesome. Thanks, Cole! I use a Mark II 5D with a 50mm lens. I’m so happy to hear you enjoy my photos and recipes! Thanks for checking out the site!